Beyond These Dark Lands Are Edges Of Joy: The Author's Discussion On His Poem, There Is No Question, A Poem About Foundations. The Author's Discussion On His Poem, There Is No Question, A Poem About Foundations. The poem, There is No Question, a Poem About Foundations, is found on page 3 in the book titled, Beyond These Dark Lands Are Edges of Joy, Poems of Comfort and Hope, by A.E. Dozat. I choose the title for this poem with irony since it opens with questions, and pursues those questions throughout the first half, but the title is really explained by the concluding line. (I can't give that away here, you have to buy a copy and read it). This poem is 25 lines long and most of the lines are 4 to 6 syllables. It opens with the word, "Maybe" which is repeated in lines 1, 5, and 9. I admit using the word, "Maybe," reflects a soft voice which is reinforced with the words me and us but the soft voice is mitigated with the word, "certainly," at line 13. I considered changing the voice in the second half and it would have made sense for the second half but would have been distracting and cost the poem unity. The soft voice persists with the use of we and us but is dominated by word, "Certainly," line 13, 16 and 25. The following two maybes are less dramatic but still expressions of solitude or estrangement. The certainties contrast the maybes with expressions of God's communion. The maybes reflect our questions of why do we go through trials and problems. The reasons given include our rebellion, anger or stubbornness. There are many reasons we go through trials and there are times we just do not know why so it is all a bunch of maybes. But there are certainties "We must lean on God..." and "God is willing to reach to us and revive us ..." The concluding lines point to the ultimate Certainty. The message of this poem is simple. The point is God; that He is the ultimate answer to our questions and the ultimate source of comfort. 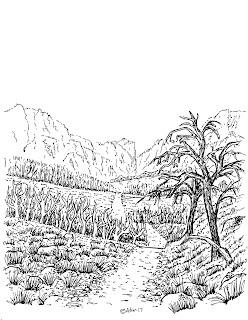 I drew the illustration of low hills covered with barren trees and a road leading to distant mountains. The barren trees reflect the maybes of the poem causing you to wonder why the trees are barren. The distant mountains are a classic device that represents God. This poem, like most in the book, encourages you to have an intelligent confidence in God during the dark times. 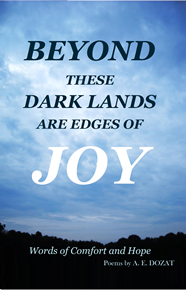 You can read the poem, There Is No Question, A poem About Foundations, in my book Beyond These Dark Lands Are Edges Of Joy, which you can purchase for $9.62 plus shipping, use the Buy Now button below. You can read this poem on page 3 of the book. 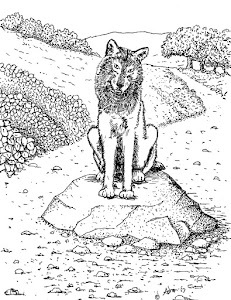 If you would like to read a sample poem choose the link below for the website. To purchase from Amazon CLICK HERE.